Mini Roadster prices revealed | What Car? 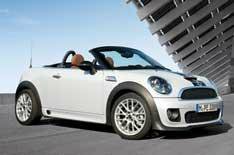 This is the new Mini Roadster; the soft-top version of the recently launched Mini Coupe. Unlike the Mini Convertible, its a two-seater; the first open-top Mini with this configuration. Most of the Mini Roadsters exterior body panels are shared with the Mini Coupe, including a lower, more steeply angled front windscreen than the Mini hatchbacks. The Mini Roadsters canvas roof is new. It lowers or raises in around 10 seconds and, when opened, it folds down behind the seats, leaving the 240-litre boot space unaffected. There are fixed stainless steel roll-over bars the Mini Convertibles only pop up if the car starts to roll. The model line-up mirrors that of the Coupe, with Cooper, Cooper S and John Cooper Works petrol versions and the Cooper SD diesel. Theres a premium of between 1055 and 1375 over Coupe models.